Tis the season… I absolutely LOVE Christmas! In fact, most of my fondest childhood memories are connected to this blessed holiday. So, a couple of weeks ago, something unexpected happened...one night my wife, Lillian said, “Honey you know what I would love to do? I would love to go to New York for Christmas, go to Rockefeller Center, see the Rockettes, you know, experience a Christmas like I did as a child.” I told her that sounded great to me. Now get this part...the very next day, my CMO, Marty Fahncke called and asked if Lillian and I would be interested in going to New York for Christmas and take a contest winner with us… to see the Rockettes! I couldn’t believe it, less than 12 hours after my wife said she wanted to go to NYC, Marty calls with the same idea…it was obvious that this was supposed to happen! 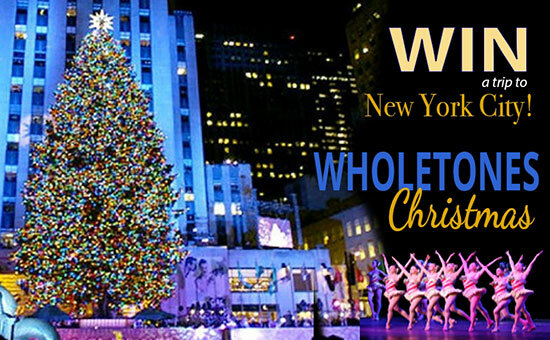 So my dear Wholetonians…we’re having a contest, and some lucky couple is going to be hanging with us in the Big Apple! Your airfare, hotel, an amazing dinner, and of course, the amazing Rockettes…100% covered! #2 SHARE your personalized sharing link with as many friends as you can. With your special link, they get 10% anything Wholetones they purchase! #3 For each person who make a purchase through your personalized sharing link, you get one entry in the grand prize drawing. It's that simple! Have you already signed up in our refer a friend program? Then the key is to share, share, share! Post your sharing link on Facebook, on Instagram, email it to your friends and family. The more you share, the more they save, and the more chances you get to come to New York with me for Christmas! I can't wait to see you in New York! PS – This Friday I'll be making my “National TV Debut” on QVC! We'll be featuring an amazing deal on a Wholetones 2Sleep bundle! I'll be on a segment called “Kerstin's Gift Favorites” sometime from 12 Noon to 2pm Eastern. You can watch it live here: https://www.qvc.com/content/shop-live-tv.html. Please help me out by watching the segment and praying for me to do well on the airing so we can help more people SLEEP!